Totten Glacier drains at least 3.5 meters of eustatic sea level potential from marine-based ice in the Aurora Subglacial Basin (ASB) in East Antarctica, more than the combined total of all glaciers in West Antarctica. Totten Glacier has been the most rapidly thinning glacier in East Antarctica since satellite altimetry time series began and the nature of the thinning suggests that it is driven by enhanced basal melting due to ocean processes. While grounded ice thinning rates have been steady, recent work has shown that Totten’s floating ice shelf may not have the same thinning behavior; as a result, it is critical to observe ice shelf and cavity boundary conditions and basal processes to understand this apparent discrepancy. Warm Modified Circumpolar Deep Water (MCDW), which has been linked to glacier retreat in West Antarctica, has been observed in summer and winter on the nearby Sabrina Coast continental shelf and deep depressions in the seafloor provide access for MCDW to reach the ice shelf cavity. Given its northern latitude, numerical ice sheet modeling indicates that Totten Glacier may be prone to retreat caused by hydrofracture in a warming climate, so it is important to understand how intruding MCDW is affecting thinning of Totten Glacier’s ice shelf. Here we use post-processed, focused airborne radar observations of the Totten Glacier Ice Shelf to delineate multi-km wide basal channels and flat basal terraces associated with high basal reflectivity and specularity (flatness) anomalies and correspondingly large ice surface depressions that indicate active basal melting. Using a simple temperature-attenuation model, and basal roughness corrections, we present basal melt rates associated with the radar reflection and specularity anomalies and compare them to those derived from numerical ocean circulation modeling and an ice flow divergence calculation. 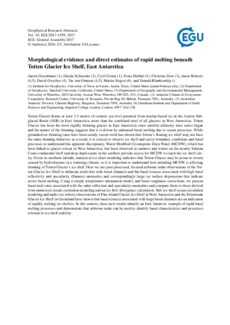 Sub-ice shelf ocean circulation modeling and under-ice robotic observations of Pine Island Glacier Ice Shelf in West Antarctica and the Petermann Glacier Ice Shelf in Greenland have shown that basal terraces associated with large basal channels are an indication of rapidly melting ice shelves. In this context, these new results identify an East Antarctic example of rapid basal melting processes and demonstrate that airborne radar can be used to identify basal characteristics and processes relevant to ice shelf stability.